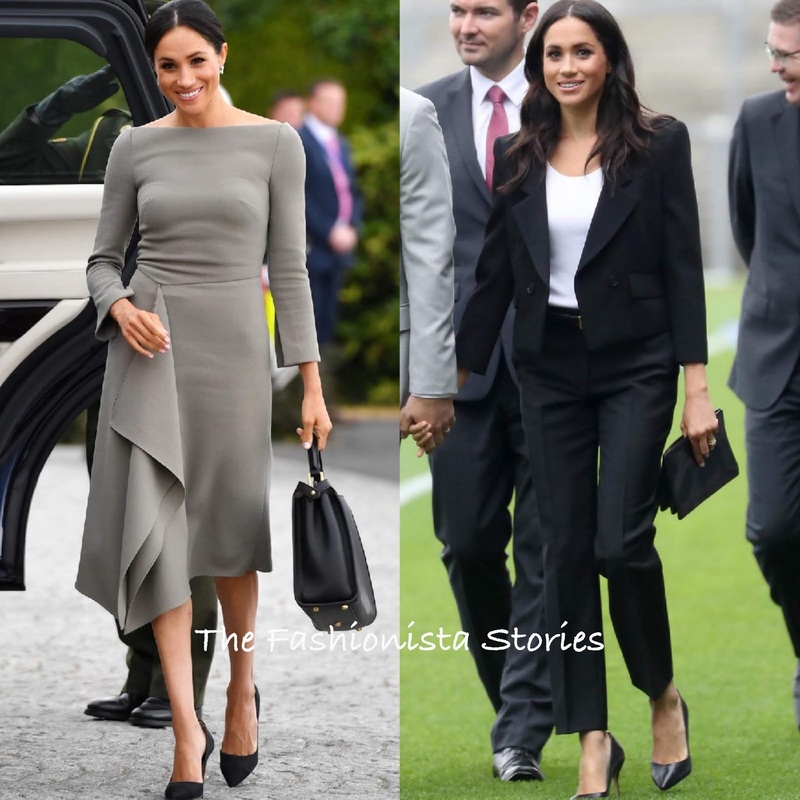 Following her previous outings, Meghan Duchess of Sussex stepped out again today(July 11th) in Dublin, Ireland, wearing two different looks. First, she spotted arriving at the Aras an Uachtarain wearing a Bespoke ROLAND MOURET long sleeve grey dress with a bateau neckline and a cascading draped panel on the skirt. Meghan's dress seems to be inspired by a dress from the RESORT 2018 collection. I actually like this dress along with the color but the bra that she is wearing is what makes this look fall apart. Next, she was spotted arriving at Croke Park, home of Ireland's largest sporting organisation, the Gaelic Athletic Association. She worked a simple but sophisticated business look courtesy of GIVENCHY. Her black two-piece suit was styled simply with a white shirt underneath and a black clutch & pumps. Center part waves and minimal make-up finished up her look.